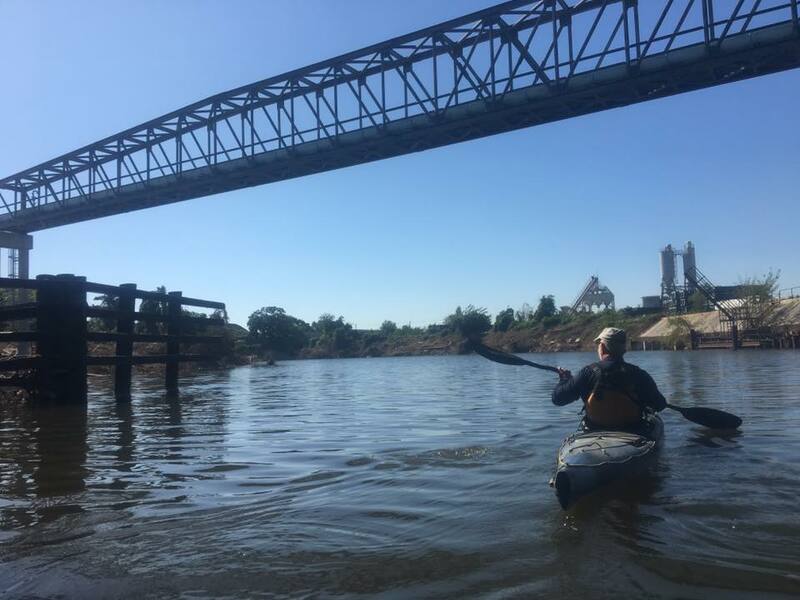 French Broad Riverkeeper Hartwell Carson and Bayou City Waterkeeper Bruce Bodson (pictured) survey water quality on the Green Bayou in Houston, TX shortly after Hurricane Harvey. Houston is home to many toxic and industrial sites, and the hurricane caused widespread chemical and wastewater leaks. Bruce and I, alongside Savannah Riverkeeper Tonya Bonitatibus, are a last-minute crew assembled by the Waterkeeper Alliance to respond to the aftermath of Hurricane Harvey. We’re in Houston to assess the hurricane’s impact on the many oil, gas, chemical and industrial sites in the region — after receiving over 50 inches of rain in many areas, there is real concern about stormwater runoff, overflowing wastewater plants, and spills and leaks from the massive oil and gas facilities near Houston’s waterways. 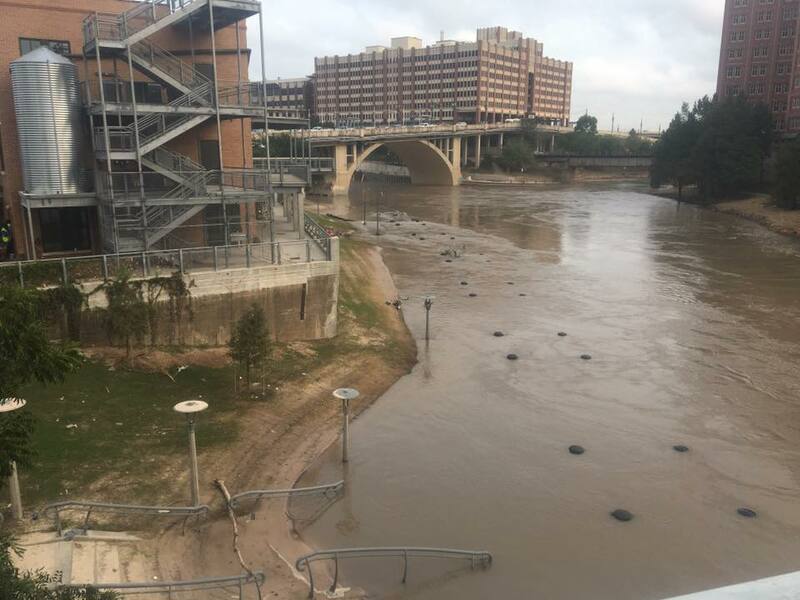 The Buffalo Bayou overflows in downtown Houston following Hurricane Harvey. Many areas in Houston received over 50 inches of rain during the storm. Being “in it” not only meant that your home had flooded and belongings had been destroyed. Too often, it meant the floodwaters brought a toxic stew into your neighborhood and your house. On one of our monitoring trips, we examined the area’s many superfund sites. Houston has a long history of heavy industry and pollution, and therefore is home to some of the most toxic sites in the country. One of those sites is the French LTD. It sits close to the San Jacinto River, directly next to a low-income mobile home community that was completely devastated by the floodwaters. Trailers there are overturned and cars are underwater. There is no indication that anyone has been here to inspect the toxic water pollution caused by the storm. 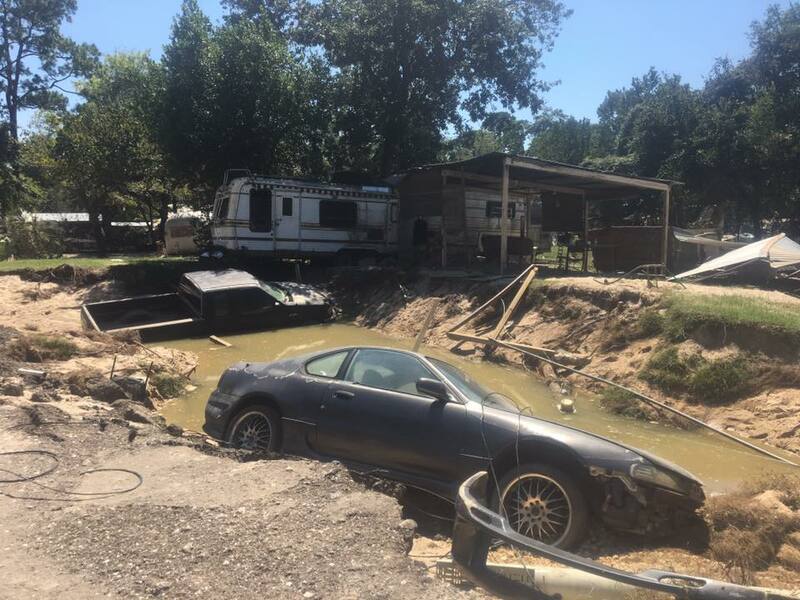 This mobile home community next to French Ltd., a superfund site, was devastated by flooding and toxic leaks during Hurricane Harvey. The pollution is ironically obvious, as it sits directly in front of a fence with a sign warning that the area beyond it is a hazardous site. A black, oily ditch flows directly into the neighboring community. As I walk through to inspect the damage, some of the residents are piling their flood-soaked belongings on top of giant debris piles. Just down the road from there, a crew in hazardous waste removal suits are using weed eaters to remove the oily grass and hanging a long plastic covering over the fence. I wonder what they’re trying to hide. I hold my phone over the fence to take pictures, which reveal trees and bushes coated in a thick oily sheen at least five feet high. I wonder: Has anyone warned the neighboring residents of the toxic threat the floodwaters pose to their health? Left: The “No Trespassing” sign in front of French Ltd., a superfund site, warns of toxic waste beyond it. 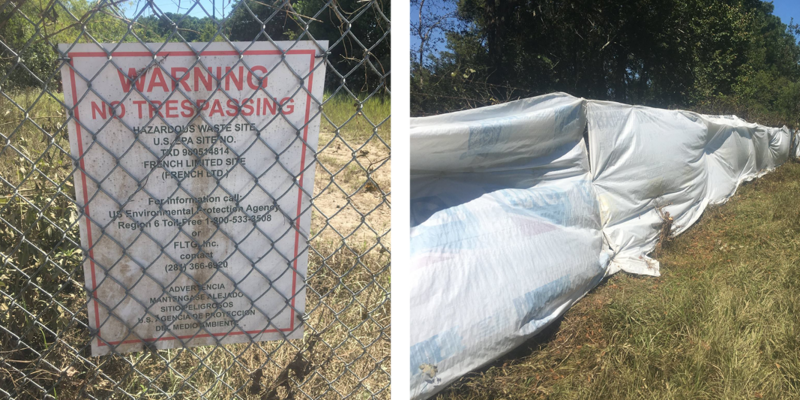 Right: The Waterkeepers discovered a fence outside of Deep Down Inc., an industrial site that saw a large amount of oil wash out of its waste pits during Hurricane Harvey. Being a Waterkeeper means being a watchdog for your waterway. 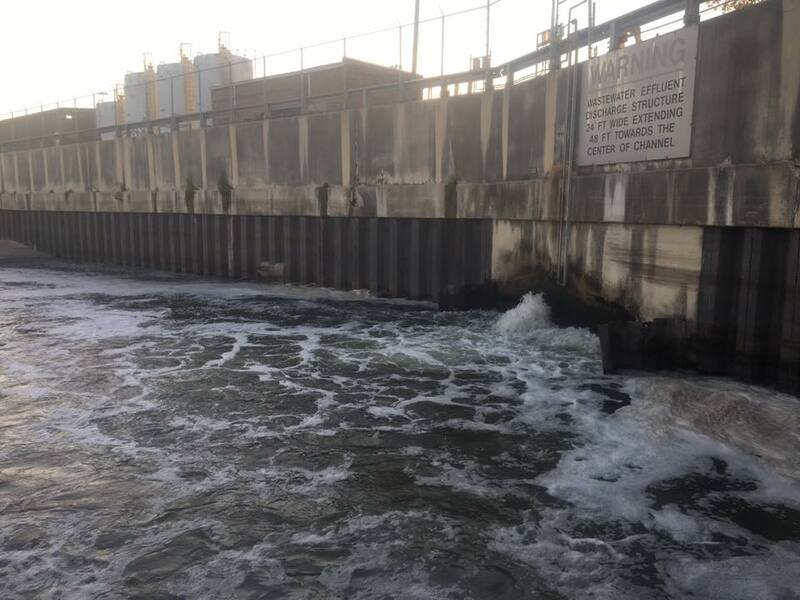 That can mean monitoring facilities from the air, checking their discharge permits, and getting drenched in sewage in order to make sure industries supported by oil and gas aren’t polluting the area’s waterways. That job is made much more difficult in Houston, because Homeland Security prevents access by water to most of these superfund and industrial sites. 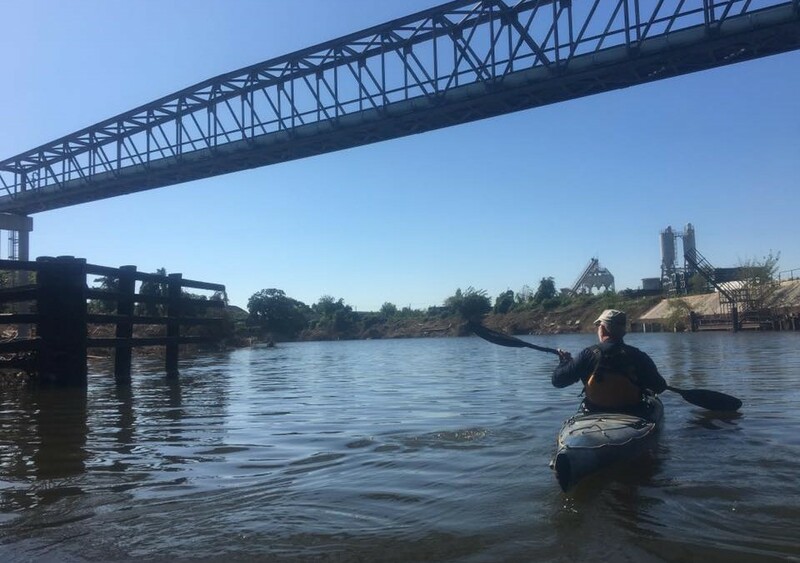 Bruce’s calm response to potentially being killed by toxic chemicals while kayaking comes from a career spent around the oil and gas industry. A career that has seen a lifetime’s worth of oil and gas pollution, lakes of chemicals sunken into the ground, and chemical explosions. The risk of dying from a toxic chemical exposure is not something I am accustomed to when I go paddling. But in Houston — ground zero for the oil and gas industry — it is a way of life. It’s illegal for these chemicals to leave the property, Bruce says, but there isn’t much incentive to stand up to the multi-billion dollar oil and gas giants like ExxonMobil and BP. When our boat patrol is finished, we drive through a residential neighborhood bordering the ExxonMobil refinery. Many of these people live and breathe the toxic byproducts of our country’s fossil fuel addiction every day. The scenes we pass of kids riding bikes and playing on swing sets would be totally normal, if it weren’t for the backdrop of methane flares and toxic air emissions just over their heads. “During Harvey, the released toxins were so intense that a ‘shelter in place warning’ was issued for this neighborhood in Baytown,” Bruce explains. “They even advised against using air conditioners, to prevent toxic chemicals from being drawn into homes.” I fully believe this, because my skin has started to burn from the water that splashed all over us during the boat patrol. “This looks like the future scene from the Terminator movies, where the robots have destroyed the Earth,” I tell Bruce, only half-kidding. For a moment, I think that maybe this area should remain a sacrifice zone, so the rest of the country can burn oil and gas. But when I look back at the blue herons taking off from the discharge of oil refineries, and see kids riding bikes under the shadows of methane flares, I remember that this fight to protect the waterways is worth fighting, and that it is exactly what Waterkeepers do best. Waterkeepers take on David versus Goliath fights every day. This is a fight for the future — not only for the future of the people and waterways around Houston, but for the future of our planet. The oil and gas industries are strangling our ability to develop a clean energy future. A future where people can relax in their yards without fear of toxic pollution, paddle and swim in their waterways, and use renewable energy that doesn’t contribute to climate change. This is a battle worth fighting, and a battle the Bayou City Waterkeeper and Waterkeeper Alliance intend to win. Wastewater from a Houston wastewater treatment plant flows into the Green Bayou. Waterkeepers monitored and documented the pollution to fight for a clean water future.